Italy ranks high on many “top” lists: Considering that Italy is only the 22nd most populated nation and the 73rd largest in terms of land mass, its people hold many impressive top-10 rankings. Italy boasts a long tradition of innovation, inventions, a rich reservoir of creative human talent, and world-class ratings in numerous categories. Italy ranks low in the following areas for categories in which it’s desirable to be at or near the bottom of the nation’s list: number of prisoners, crimes with firearms, number of rapes, suicide rate, drug offenses, divorce rate, fast food consumption, obesity and teen pregnancy. Saint Catherine of Siena (Santa Caterina di Siena) is one of Italy’s most famous and powerful women in religion, public affairs, and literature. She was born on 25 March 1347 in Siena, the 23rd child out of 25 (her twin, the 24th, died at birth). Her parents were Giacomo di Benincasa, a cloth-dyer, and his wife, Lapa. At the age of 7 she felt a calling and made a vow to serve Christ. At age 16 Catherine began to wear the habit of the Dominican Tertiaries. She is especially well known for the discipline of fasting. Scholar Rudolph Bell described her life as a powerful example of faith in his book Holy Anorexia, written in 1985. Catherine tended to the sick and served the poor. She wrote letters to men and women in authority, especially begging for peace between the republics and principalities of Italy and for the return of the papacy from Avignon to Rome. Catherine's public influence reached great heights because of her deep spirituality and strong convictions. She had a detailed correspondence with Pope Gregory XI, asking him to reform the clergy. In June of 1376 the Republic of Florence sent her to Avignon, France, to make peace with the Papal States. She impressed the Pope so much that he returned his administration to Rome in January of 1377. Catherine’s 300 letters are considered one of the great works of early Tuscan literature, and her poems are widely published. Her major work is the Dialogue of Divine Providence. She died on 29 April 1380 in Rome, and is buried in the Church of Saint Maria sopra Minerva. She was canonized in 1461 and has been the co-patron saint of Italy with Saint Francis of Assisi for many centuries. Pope Paul VI bestowed on her in 1970 the title of Doctor of the Church, and she was the first woman ever to receive this honor. In 1999 Pope John Paul II made her one of Europe's patron saints. 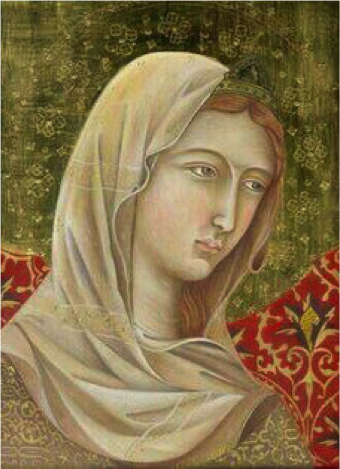 She is one of the most influential women of Christendom. Florence, with its breathtaking sunsets over the Arno river, its art treasures and gourmet pleasures, make it one of the world’s most loved cities. Firenze is alluring in a way that few places are which explains why it’s a mecca for travelers. Florence is the capital city of the region of Tuscany and from 1865 to 1871 it was also the seat of government for the Kingdom of Italy. Florence's recorded history began with the establishment of Florentia in 59 BC. A center of medieval European trade and finance , the city is often considered the birthplace of the Italian Renaissance and was long ruled by the Medici family. Florence is also famous for its fine art and Cosimo de' Medici was the first Medici family member to exert influence in Firenze. Cosimo was succeeded by his son Piero , followed by Cosimo's grandson, Lorenzo de’ Medici in 1469. Lorenzo was a great patron of the arts, commissioning works by Michelangelo , Leonardo da Vinci and Sandro Botticelli. The Medici family dominated politics in Florence for 250 year and led cultural and artistic achievements equaled only by Athens in the golden age. The Medici’s intermarried with most royal families in Europe. Another important Florentine was Niccolò Machiavelli, author of “The Prince” and creator of modern political science. The symbol of Florence is the red fleur-de-luce (Flower of light or lily flower and Fleur-de-lys in French. Adopted by King Phillip of France and it is a symbol associated with the Blessed Virgin Mary.) Places to visit: Ponte Vecchio, first constructed by the Etruscans, is well known for the multitude of shops built on it. Palace San Lorenzo, which has become a monument to the Medici family. The Uffizi Gallery, one of the finest art galleries in the world. Accademia dell' Arte del Disegno which houses Michelangelo's Statue of David. There is a replica of David (“Davide” in Italian) in front of the Palazzo della Signoria, an impressive and delightful piazza. Be sure to see the original David. The unfinished works of Michaelengelo, huge slabs of partially chiseled marble, line the walkway as you approach the magnificent David and they are equally awe-inspiring. Michelangelo personally selected most of the marble (his favorite brand was statuario) for his works in the mines of Carrara the oldest industrial site of any kind internationally. It’s been in constant use for over 2,000 years and the 400 quarries of Carrara, world capital of marble, produce more than 200,000 tons of marble every year—the largest and best quality of marble anywhere. The rivers surrounding Carrara are white from the marble dust. Pitti Palace is lavishly decorated with the Medici family's private collection. Adjoining the palace are the Boboli Gardens, elaborately landscaped and with many interesting sculptures. The wondrous Santa Croce Church, started by St. Francis of Assisi, contains the monumental tombs of Galileo, Michelangelo, Dante, Machiavelli and many other notables. The crowning architectural jewel of Florence is the domed Cathedral of Santa Maria del Fiore, also known as "The Duomo ". The magnificent dome was built by Filippo Brunelleschi. The nearby Campanile Tower (by Ambrogio Bondone Giotto 1267-1337) and the Baptistery of San Giovanni (St. John) are other highlights. Across from the Duomo are the grandiose bronze doors of Lorenzo Ghiberti. Born Lorenzo di Cione Ghiberti in 1378, he became a favorite son of Firenze. The North Doors took him 21 years to complete. These gilded bronze doors have 28 panels each capturing biblical scenes from the New Testament which the master artiste created from 1404-1424. Ghiberti then spent the next 29 years working on a second door for the East entrance with 10 panels depicting scenes from the Old Testament. Michelangelo was in awe and so admired the gates that he nicknamed them The Gates of Paradise and the name remains almost 600 years later. (Three photographs: Full view of Gates of Paradise; close-up of Queen of Sheba and Solomon on the Doors of Paradiso and a self-portrait of Ghiberti which serves as a small tribute to the master sculptor.) A Latin inscription appears on one of the doors: "Look at this beautiful work that I have made." Ghiberti was one of seven artists to vie for the commission of the original door. He began the masterpieces when he was only 25 and worked for almost 50 years to complete both crowning accomplishments. After finishing the two doors a friend observed them in amazement and said it must have given Ghiberti tremendous pride to say “These are my creations”. The master artistè died on 1 December 1455 in Florence. Grand Hotel & La Pace***** in Montecatini Terme (21 miles Northwest of Florence). Built in 1870, it’s a masterpiece of Tuscan architecture, lavishly furnished with priceless antiques. Attentive service in the tradition of the past harmoniously complements the hotel’s contemporary comforts, spa facilities and surrounded by rolling meadows and parkland. The natural spas at Montecatini date back to the 14th Century, are peaceful and relaxing and make for perfect resting places. Enjoy a glass of enriched water or take the plunge for the full treatment. At the Grand Hotel & La Pace and in Montecatini Terme you'll be in illustrious company. Previous visitors include Giuseppe Verdi, Gioacchino Rossini, Giacomo Puccini, Princess Grace, Orson Welles, Eros Ramazzotti, Clark Gable, Mary Pickford and Douglas Fairbanks, Spencer Tracy, Audrey Hepburn, Prince Ranier, Clark Gable, Lady Clementine Churchill, Madame Curie, Randolph Hearst, King Vittorio Emanuele III, King Saud and other assorted European royalty. At Grand Hotel & La Pace’s health center, as in the Roman establishments many years ago, you'll find a gymnasium, water baths of different temperatures and a professional beauty farm where you can get massages, purifying treatments with sea plant and natural herb extracts, mud and everything you need in order to find the aesthetic harmony of your body. Hotel Director Rolando Disperati and his staff provide an idyllic setting and first class service for rejuvenation and relaxation. Castello di Fonterutoli. Castellina in Chianti, SI, Siena. Today, after six centuries, the Mazzei family is still committed to the cultivation of the vine and the production of fine wine. The first documents concerning the Mazzei, who originated in the winemaking zone of Carmignano just to the west of Florence, date to the beginning of the 11th century. Filippo Mazzei (1730-1816; portrait to the left) was a significant historical figure. A restless globetrotter, wine merchant, trained surgeon, intellectual and scholar, he was invited by his friend Thomas Jefferson, at the end of the 18th century, to plant a vineyard near Monticello in Virginia. He arrived at the estate with a group of Tuscan vine-dressers and planted the first vineyard in Virginia. "I thank you for your kindness and generosity," George Washington noted in a letter to Mazzei, dated 1 July 1779 and sent from New Windsor. "Concerning the cultivation of the vine, I am happy to hear that your vineyard is prospering so well." Filippo Mazzei bought 400 acres of land next to Monticello and Thomas Jefferson gave him 2,000 more as a gift. Mazzei was generous as well, introducing Italian horticulture to America and he brought from Italy olive pits, two hundred different kinds of Italian cherries and trees of apricots, almonds, raspberries and strawberries. Jefferson spoke to Mazzei in fluent Italian and the two became close friends. Mazzei contributed these famous words to the Declaration of Independence: “All men are by nature equally free and independent.” Mazzei participated in the American Revolutionary War and the political life of the new country. He was even involved in the drafting of the U.S. Constitution. Mazzei has been described as "an American patriot” and was honored on a U.S. postage stamp. Our gratitude to Filippo’s descendants, Lapo Mazzei and his sons Francesco and Filippo (Family portrait to the left) and wine maker Carlo Ferrini, for continuing the fine wine-making tradition since 1435 that produces such consistently stellar wines! Why should we learn Italian? Besides the fact that learning Italian is fun, there are other good reasons to grow a proficiency in the language. Elisa Dossena at Princeton University’s Italian Department recently published a compelling list of ten reasons to learn Italian. Take a look and let me know your motives! 1. Why do you think Mozart composed most of his operas in Italian rather than in German? 2. According to UNESCO (the cultural and educational agency for the United Nations) the most of the world’s cultural heritage sites are in Italy. 3. Italy is one of the top economies in the world, and many employers are seeking people who speak both Italian and English. An estimated 7,500 American companies do business with Italy and more than 1,000 U.S. firms have offices in Italy, including Chrysler, IBM, General Electric, Motorola, Citibank. Many Italian firms have offices in the U.S.
4. If you like arts, music, design, architecture, opera, food, etc. this is the reference language. Knowing Italian is greatly beneficial in several career fields. Italy is a world leader in the culinary arts, interior design, fashion, graphic design, furniture design, machine tool manufacturing, robotics, electromechanical machinery, shipbuilding, space engineering, construction machinery, and transportation equipment. 5. The Italian language is the closest to Latin, the common ancestor of all romance languages. 6. Italian developed from Latin and an estimated 60 percent of the English vocabulary also comes from Latin. Knowing Italian may help improve your scores in English. 7. No need of subtitles to see Fellini’s, Visconti’s and Pasolini’s movies! 8. A recent study showed that enrollment in Italian language classes at U.S. high schools and colleges is growing 15 to 20% faster than enrollment rates for Spanish, German and French. 9. Italian is recognized as one of the most beautiful spoken languages on the planet. 10. Italian has the highest number of words for describing food!